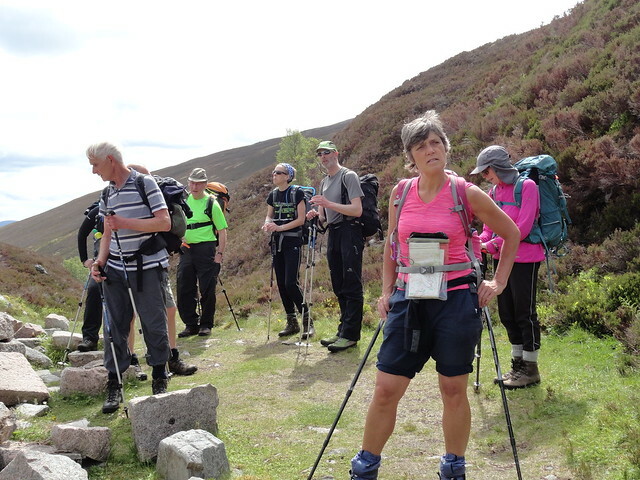 Another trip from the Falkirk Community Trust's splendid outdoor programme. The sun was shining, the air was balmy and Craig, our great leader, confidently predicted we would be back at the minibus by 6pm, latest. I whispered to Sandra - no chance, add at least an hour, if not two. She looked at me knowingly! 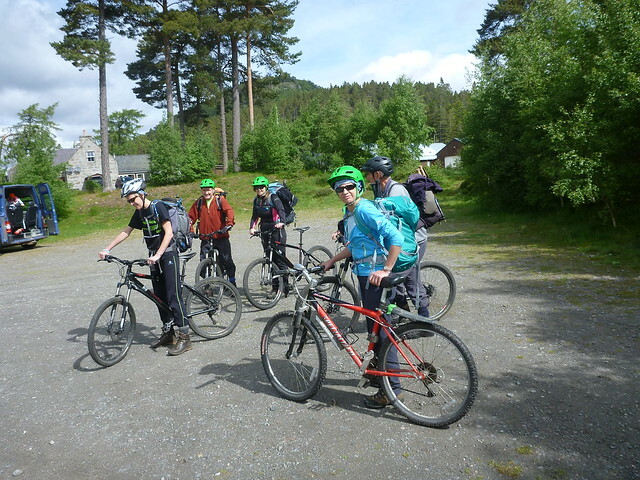 We left the car park at Keiloch and cycled to about 1.5km short of the ruins of the Slugain Lodge. Of course we missed the turn off for Slugain. 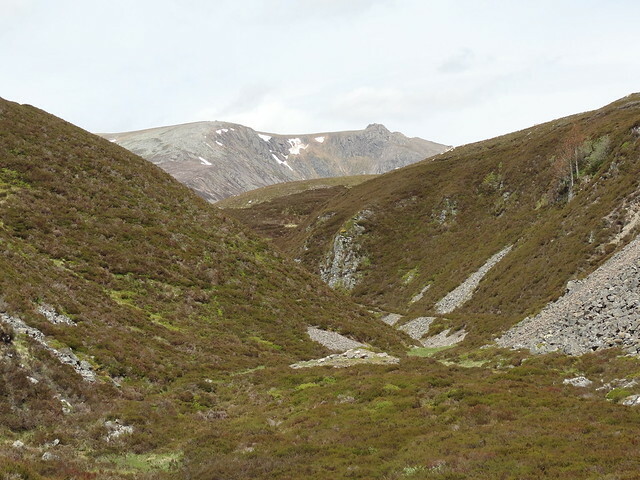 Follow all signposts for Glen Quoich and Slugain until the signpost which says Glen Quoich - take the track there. The woodland changes too: from lush green, tall and elegant pine and deciduous trees to native birches and wild flowers. 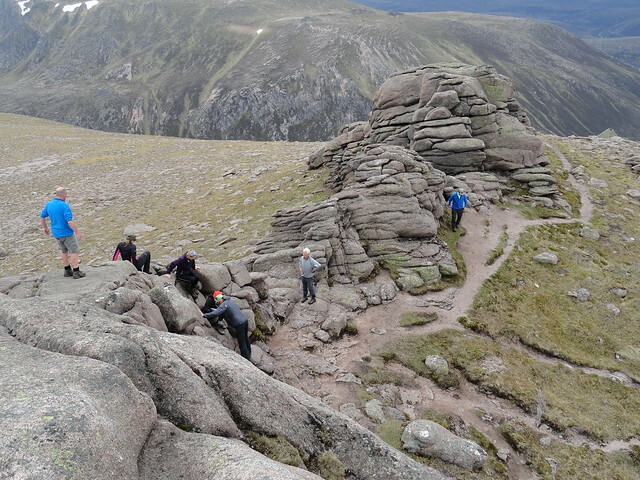 The track is OK, a bit rocky in places, but passable and it hugs the Allt an t'slugain. Beinn a'Bhuird came into view after a while and the cycle through the fairy glen was really quite pleasant. 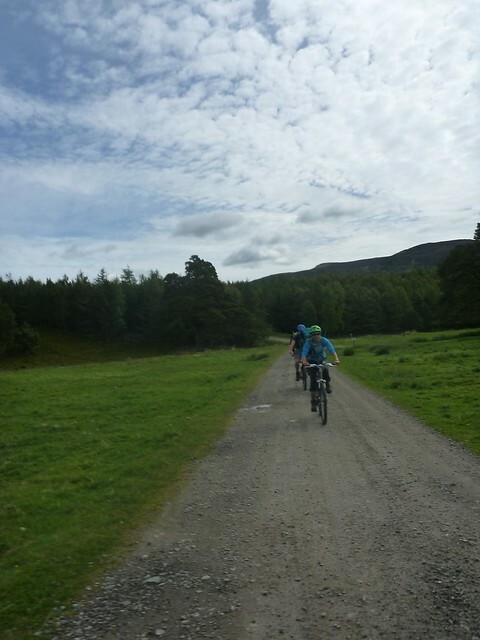 We eventually dropped off the bikes and continued on foot by the low path past the ruins initially and then up to just beneath Carn Eas. 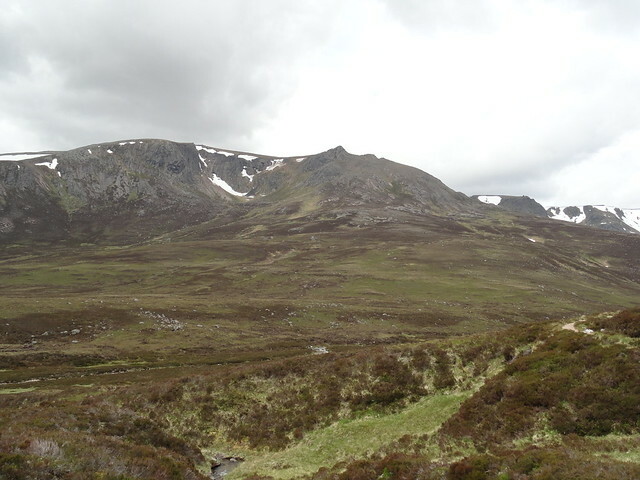 We had a short break and admired the views across to Coire na Ciche and the many specimens of dwarf cornels lying here and there by the path. The clouds were coming in but remained high and it still felt quite muggy. 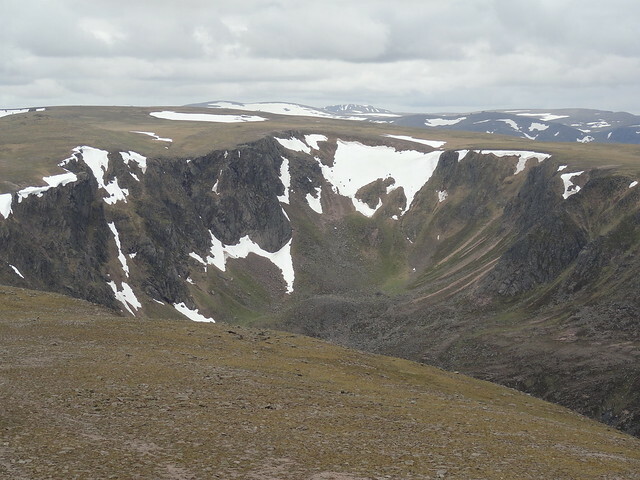 We then hurled ourselves up to Carn Eas and our efforts were rewarded by a brisk but easy walk across the summit plateau of Ben Avon but also some nice views of Beinn a'Bhuird behind us. Three of us made a quick detour to the tor of Stob Dubh an Eas Bhig, just for the hell of it , whilst the others wisely headed for Leabaidh an Daimbh Bhuidhe. What a strange landscape - such flatness disturbed and I suppose given interest by these lone tors which from a distance look fairly unassuming but close up are actually quite substantial structures. 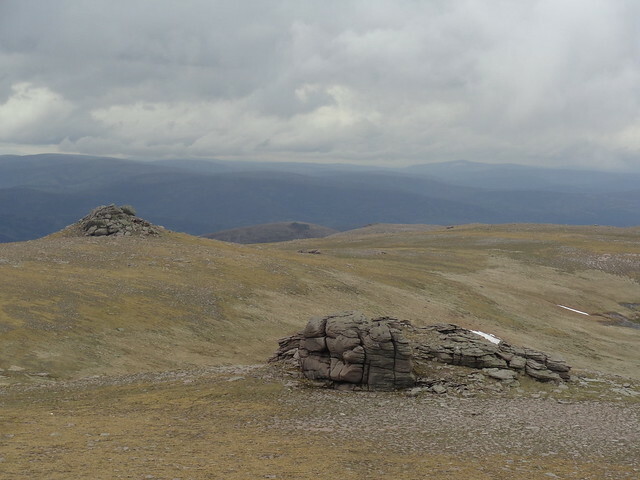 I reached the true summit last, put my rucksack down and scrambled easily up to the tallest outcrop. 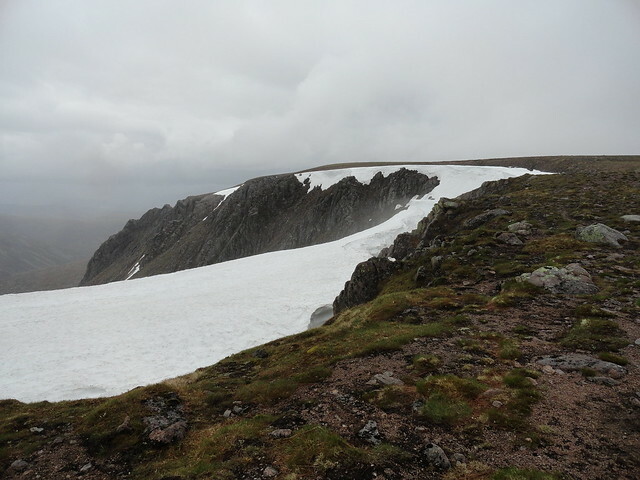 This gave superb views of the whole area and was a fine reward for a fine and relatively easy trek. Lunch beckoned at the foot of the tor and we soon set off again towards the sneck. 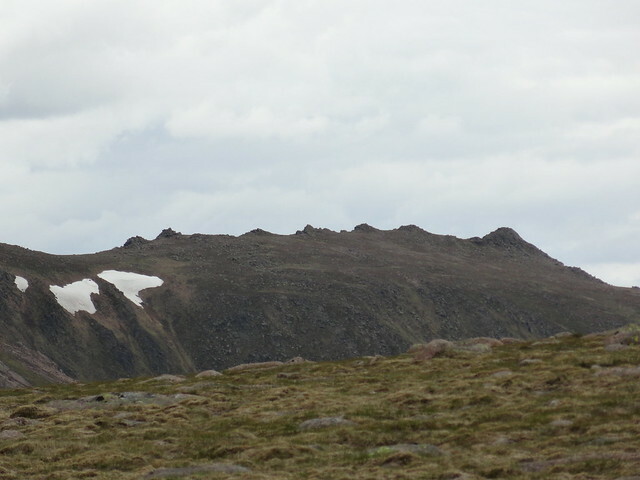 The North Top of Beinn a'Bhuird could just be discerned. 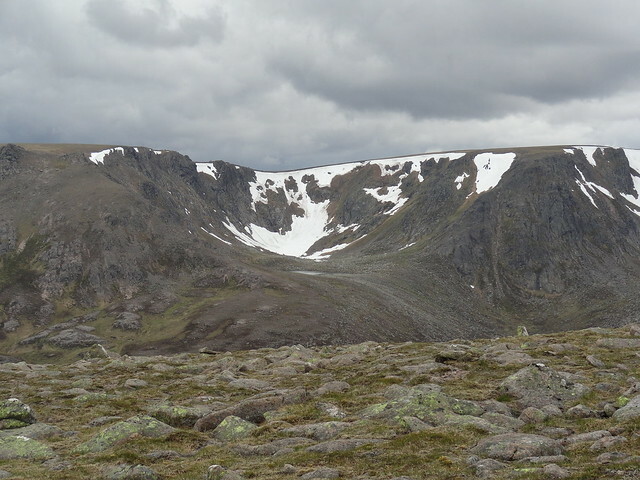 Given that it is about 5km away gives a good idea of the reasonable quality of the air and of the featurelessness of the summit plateau. All this was soon to change. 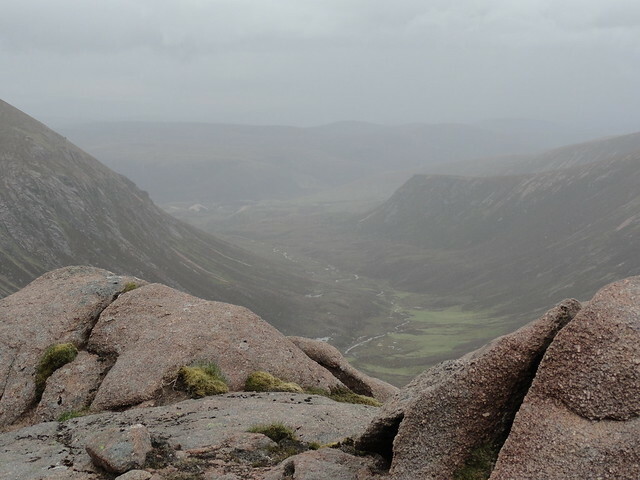 Just as we were about to begin the descent to the sneck, the rain came on. So people stopped to begin to waterproof themselves. I waited till a bit later, in the shelter of rocks which was also my cue to take a pic or two of the view down Slochd Mor and the tendrils of water running into the Avon. 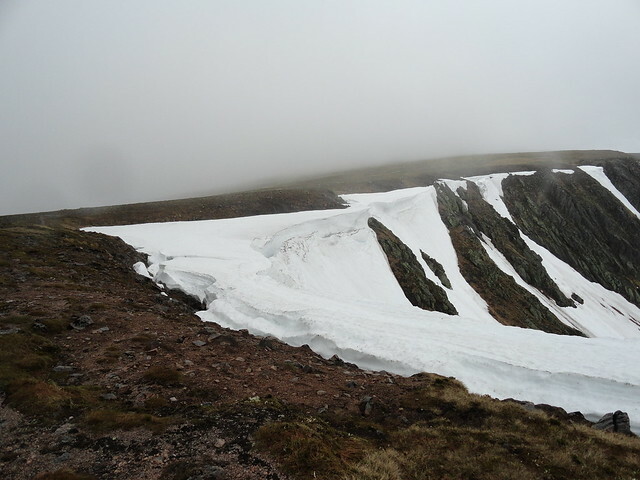 Then the weather became positively grim and there was nothing to do but keep one's head down and climb up to Cnap a'Cleirich. Some rushed to 'tick' it, I preferred to just plod on, figuring that one day I'd come back in better weather and make a point of ticking all the prominences of this unusual landscape. 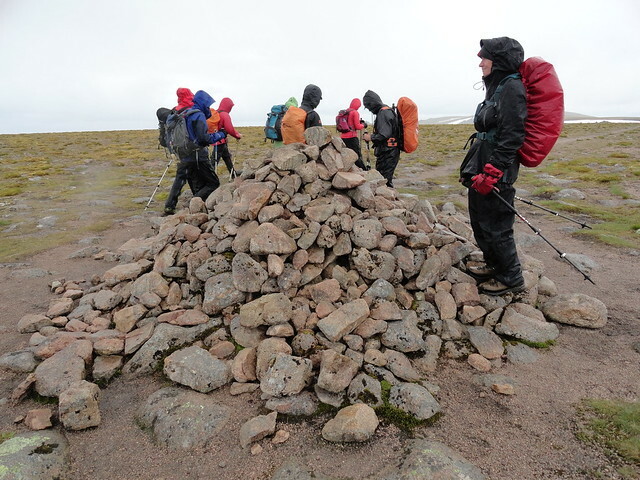 From there it takes a good 15 minutes to reach the summit cairn. 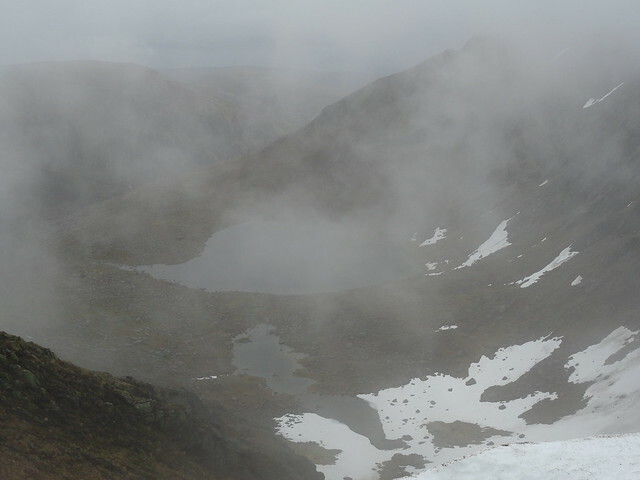 We didn't linger as the rain was by then pretty unrelenting and it was like looking through a misty windscreen. Back to the bikes. We shed some layers as the weather had improved again and the glide back down to the forest paths saw me back at the car park about half an hour later. It was 8pm by the time the last of the 9 cycled in. I was right The midges were a bit annoying (I have experienced much worse) so we didn't linger. We all piled into the bus and drove to Braemar in search of a chippie (nae luck ). So back to Falkirk in the last of the light. That's a very satisfying bike/walk combo isn't it? 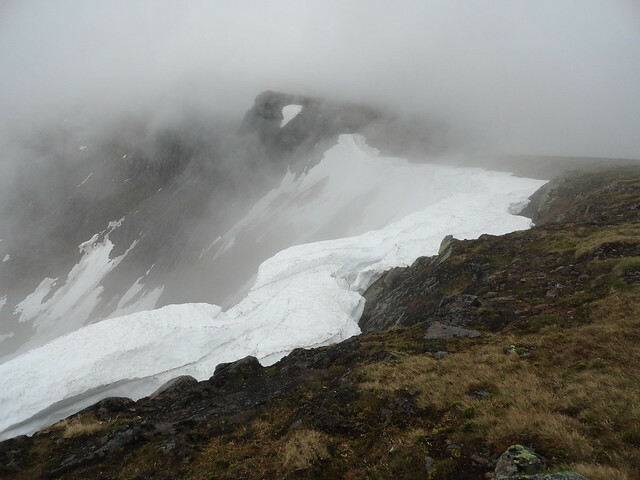 Some impressive photos of the corries & cornices on Bhuird - the rain & mist seems only to add to the grandeur. Well done all.